Jason Aguilar at Virginia International Raceway. Photo by Brian J. Nelson. 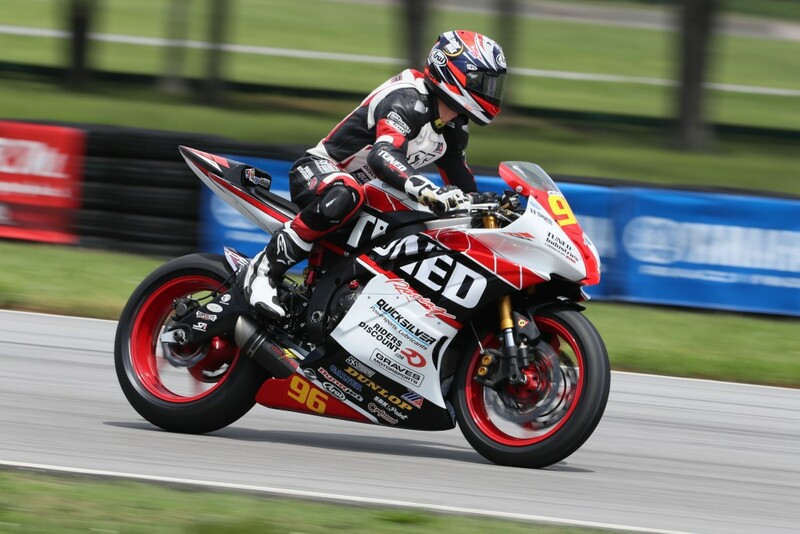 HOLLAND, Mich. (June 2, 2016) — This weekend Riders Discount/Tuned Racing is heading to Road America in Elkhart Lake, Wisconsin for the Honda Superbike Showdown of Wisconsin. Rider Bryce Prince took two podiums in Virginia, third and first respectively. Prince currently carries a 33 point lead in the Superstock 600 Championship, and hopes to further the gap in Wisconsin. Rider Jason Aguilar had a successful weekend in Virginia, securing the third spot on the podium alongside his teammate in race two. Aguilar hopes to carry this momentum into the weekend at Road America. This entry was posted in Athletes, News, Race Team and tagged Bryce Prince, Elkhart Lake, Jason Aguilar, MotoAmerica, Motorcycle Racing, Quicksilver, Riders Discount, Riders Discount/Tuned Racing, Road America, Speed and Strength, Superstock 600, Wisconsin on June 2, 2016 by Riders Discount.